And then began my obsession with tutorials. I found http://www.makeit-loveit.com/ and pinterest, my two new loves. On pinterest I found the soft block tutorial and I decided, "What the heck! I've got some extra material!" 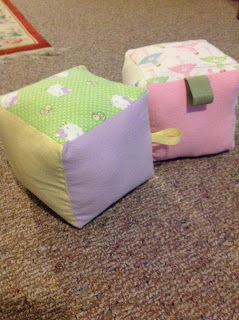 I decided, however, that I wanted my soft blocks bigger than the ones I found, so I cut out 6 square to be 8x8" instead of 5x5". It wasn't too difficult after that. It was just a matter of positioning the squares like a Christian Cross, then sewing them right sides together, sewing a ribbon looped over in the middle of one of edges*, and leaving one edge open so I could stuff in some fluff! *Double check how you've pinned in the ribbon. It would be really annoying if you pinned it wrong, sewed it, and ended up with ribbons inside your soft block instead of outside.